Happy weekend great foodie friends! Our friends Krissy and Mark have opened their Pig & Mortar restaurant and ready to serve you all of the flavors you have come to love and many new flavors you will start to love! This warm and cozy little spot on 6th Ave between Granville and Fir streets in Vancouver is sure to become a regular spot for anyone who graces their doors! Every morning you will smell the wondrous flavors of fresh baked muffins or cookies many with…… You guessed it bacon! As well as fresh coffee or breakfast sandwiches. 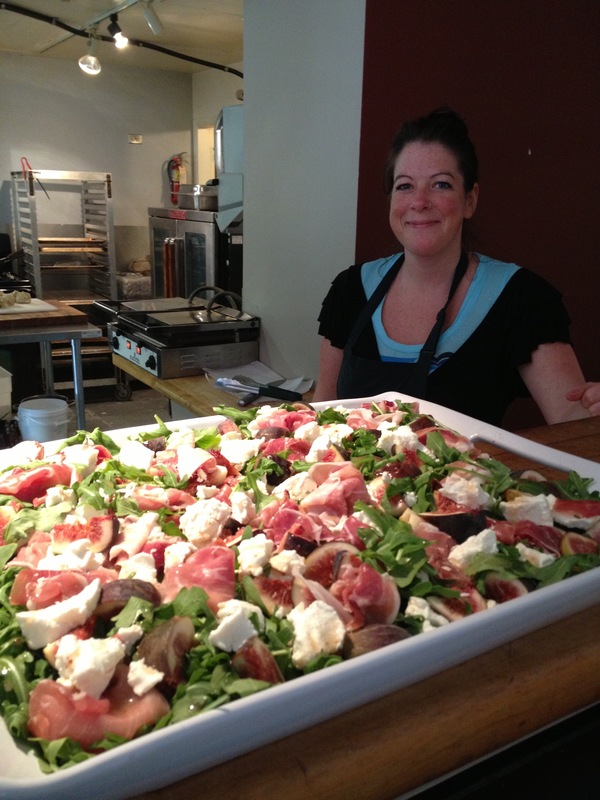 Krissy has dealt up a handful of great new salads featuring whatever fresh ingredients that she can get her hands on! This one…. Fresh arugula with goat cheese, prosciutto, fresh figs and served with a house made honey vinaigrette. Other salads included quinoa as well as mangos and other delectable fresh ingredients. 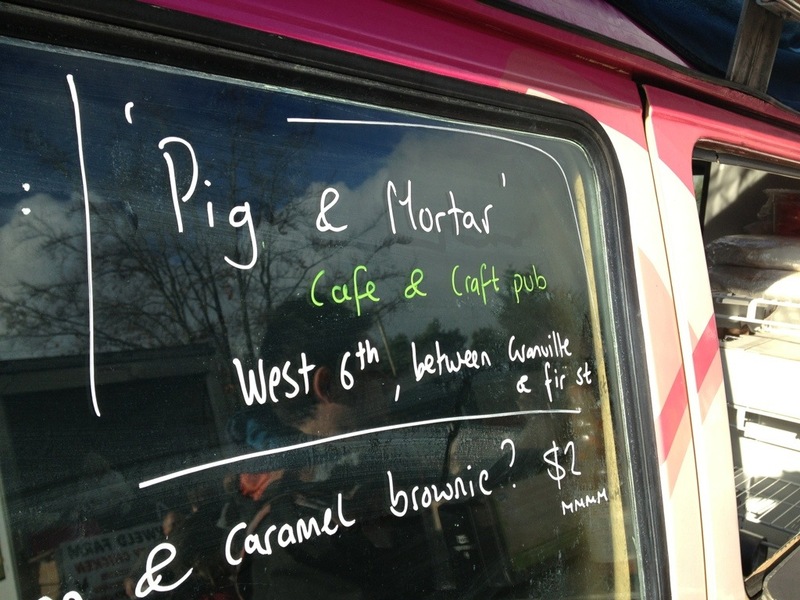 During lunch you are sure to find the good old favorites from the food truck offerings…. Or some special sandwiches features daily in the display case. 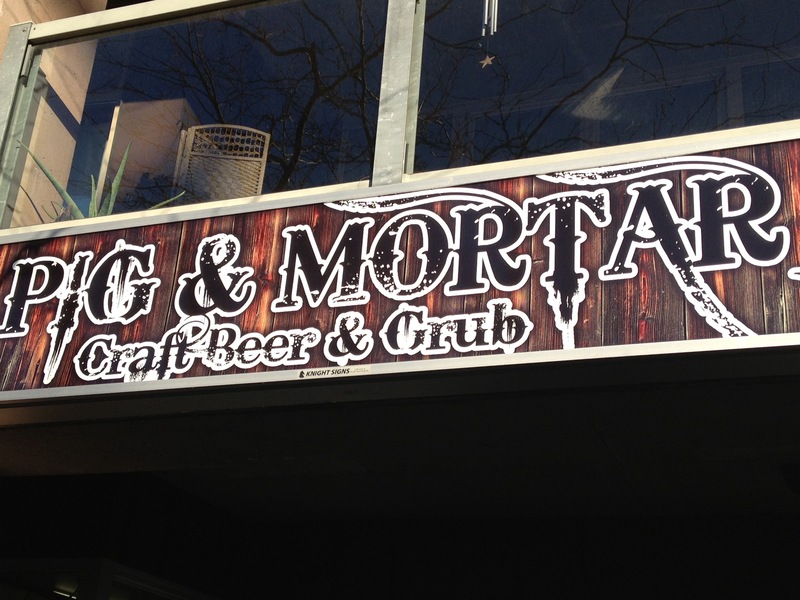 Next week starting the second week of December Pig & Mortar is going to start opening nights and will be also serving special dinner items as well as appies that will go perfectly with the craft beer now being offered. Get down to see the friendly and knowledgable staff at Pig & Mortar and enjoy a wonderful bite and a sip! Say hi to Mark and Krissy and have some fun! There is a new pig in town and it is residing at West 6th Ave between Granville and Fir street in Vancouver. Yes, Chef Krissy and Mark are opening a new spot the first week of December 2012 that will focus on taking their already quality creations and flavours to a new high. In talking with Krissy and Mark I am told that you will see some of your old favourites by day but new creations after 5pm. Chef Krissy has been busy over the last few weeks creating and testing new items to serve to their expanding list of patrons…… I am quite sure I also heard that piggy is getting a a friend that clucks… Breakfast maybe? Pretty sure….. Look for more to come in the near future confirming their new hours. The restaurant will continue to focus on serving up creations born from locally produced ingredients and as well they plan on offering a great selection of tapas or appies to serve along with some creative craft beers from local producers as well as wine served in a unique new way-on tap, and maybe even some special treats from the UK? Not sure but let’s keep our eyes open. Also look for some revolving menu offerings as Chef Krissy brings some special treats from days gone past from her childhood that were local favourites for all in the UK…… Comfort foods are on the top of Krissys mind as she creates new magic in the kitchen. Who are Mark and Krissy? We moved here from England 5 years ago. Krissy was born in Ottawa and moved to Cornwall, England when she was 7. Mark was born in Cornwall and we met in 1997. We came to Vancouver on our honeymoon and decided to move straight out so went back to England, packed up our stuff and now have a great life in the beautiful east side of Vancouver with our two cats and dog! We have always been avid travellers and have lived and travelled through many countries including Australia, New Zealand and Europe. We have always had campervans and converted trucks which we would use as our mobile home which is why we decided to buy our Westy here in Canada. Being here we realised we have finally found the place we want to stay for good so decided to create something truly amazing from our campervan. Krissy has a history of working within the food industry and also went to VCC culinary institute here in Vancouver so have always had a great passion for cooking. Krissy got all her inspiration and love for food from her Dad but also from her surroundings and the local produce that was available to her in Cornwall. Cornwall is on the coast and also has a great deal of agriculture so buying local is natural for the people who live there. Krissy would always know the farms where she got her beef, pork, eggs and cheese from and would always utilise any seasonal produce available. Vancouver and its beautiful, lush surroundings provide such a great source of produce for the consumer which is why we decided to open our food cart! 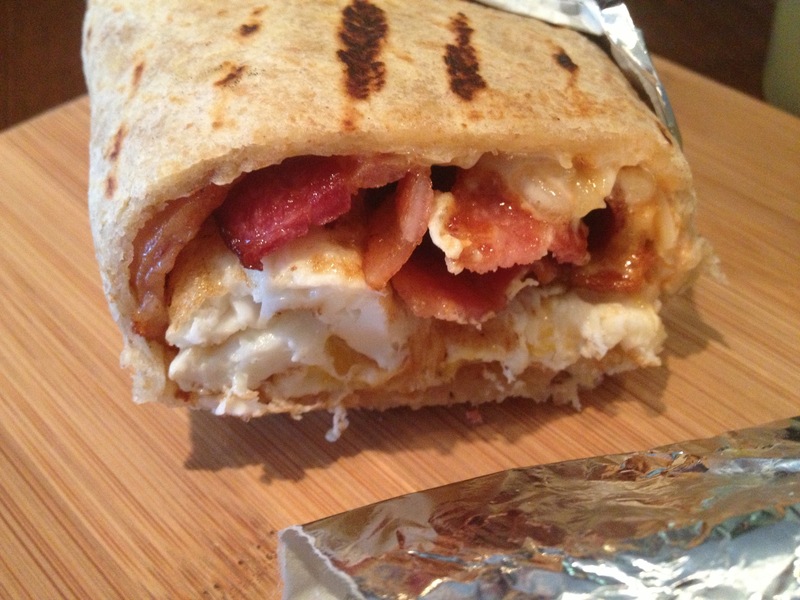 Our food cart is based around bacon for a few reasons. One its just so delicious (we’ve even caught my vegetarian friends sneaking bacon off the table when no one is looking!) and two, Bacon sandwiches are a staple street food in England. “Bacon buttie trucks” (bacon subs basically!) are like the north American hotdog stands and are super popular. We believe that there is a huge niche for that in Vancouver (we dont know of any food trucks selling bacon sandwiches as their staple). And most importantly, there are a few great local farms who produce amazing tasty bacon and that treat their animals with humane practises which is hugely important for us. We want people that buy from us to understand where the meat comes from that they are eating and respect the animal and the whole proccess. Also we want to provide food that is healthy (no hormones and weird additives that we cant pronounce!) which is why we make our own flatbread using mainly locally milled flour (the flour peddlar) and we make all our own sauces and condiments. 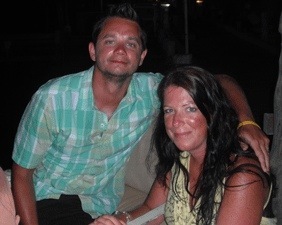 Mark and Krissy are excited about their new restaurant and working tirelessly to get it open as soon as possible. They are looking towards creating a comfortable place for friends to come and enjoy good food and local spirits while having some laughs and connecting further with their community. I thought this was worth sharing. Good day great foodie friends…. In researching this unique play on an egg dish I have found that this British treat is well known in the UK. The British say that the scotch egg needs no introduction – their English origins go back a few hundred years (they were said to have been created by the department store Fortnum & Mason of Piccadilly in 1738). The British may need no introduction but I think many North Americans may…. A scotch egg is basically a hard boiled egg wrapped in flavorful sausage meat, breaded and deep fried or baked. What Pig on The Street does is kick it up several notches! What do they do with it you ask? 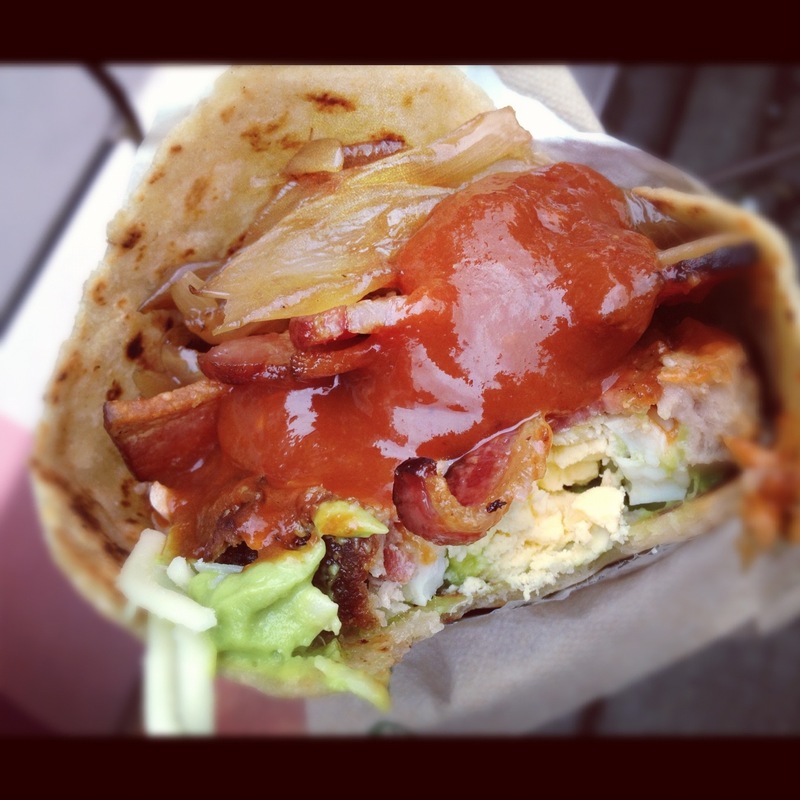 Chef Krissy adds their double smoked bacon, caramelized onions, farmhouse cheddar, avocado and a wonderful spicy heirloom ketchup…. 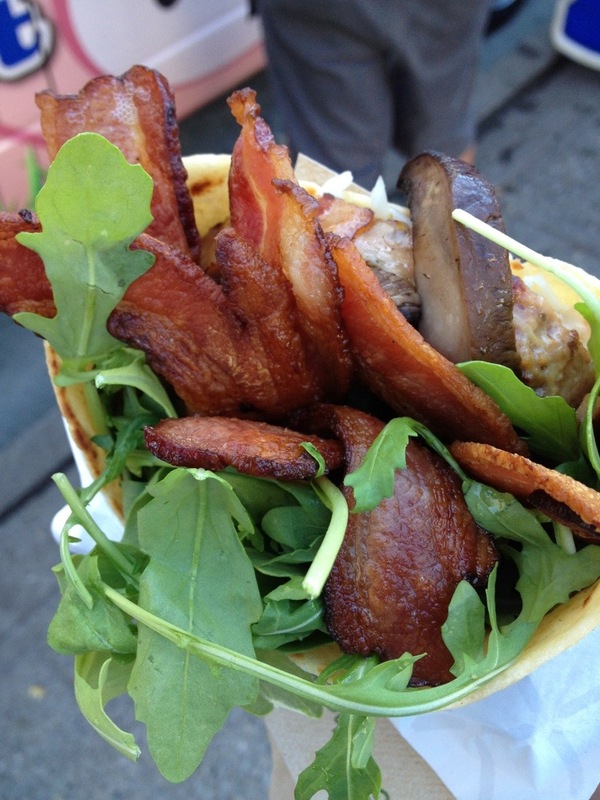 All wrapped up in Pig On The Streets handmade flat bread…. The layers of textures and different flavors found in this sandwich all go towards the wow factor on your taste buds. This unique sandwich definitely adds a new dimension to the Pigs menu board. 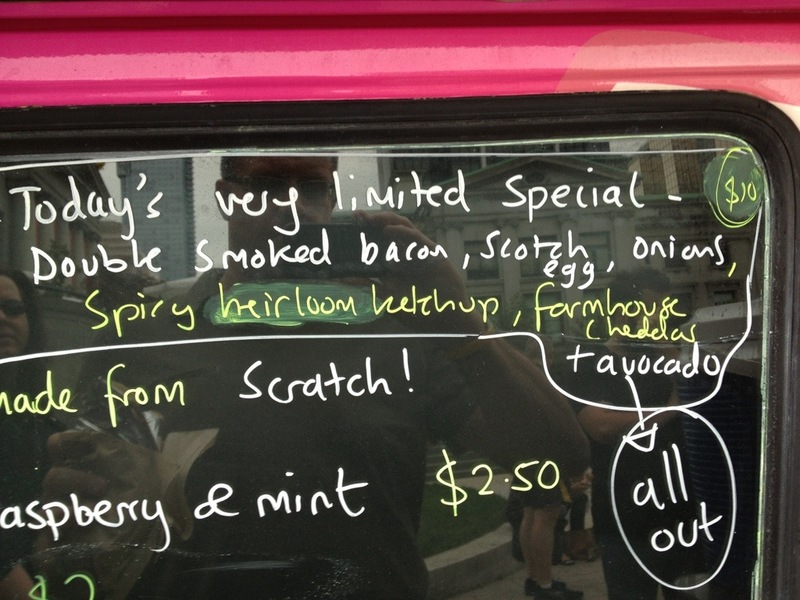 The Scotch egg is a guest star offering so keep your eyes on twitter (follow the piggy @PigOnTheStreet) for a heads up from Krissy or Mark or also for any mention on the vans “specials” window!